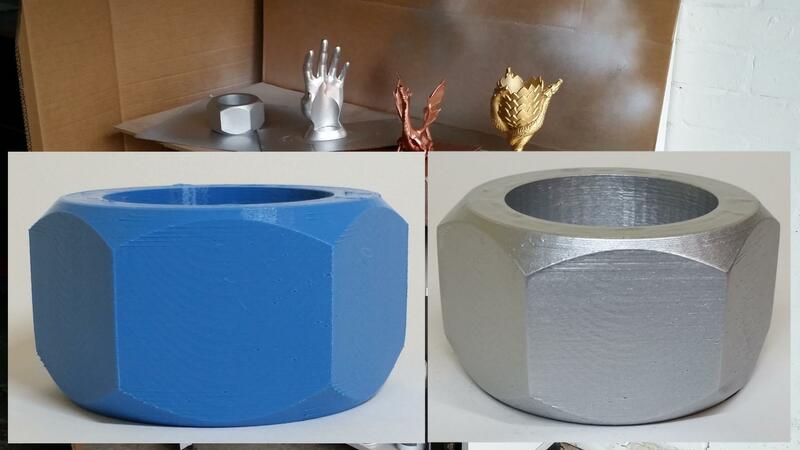 It does not matter which colour to print in, so we went for a dull white filament, to make the transformation more dramatic. 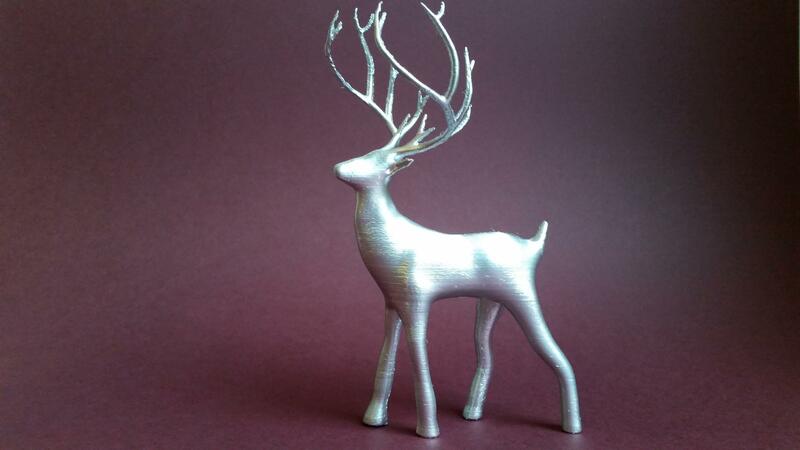 Christmas Deer design by Yeg3D was perfect for our task. Location: Spray painting should be done in the controlled environment with no draft or wind. Any items in the proximity to the spraying zone must be covered. Keep your camera at a safe distance if filming, as the tiny specks of paint can get on it. Even the slightest movement of air makes the paint particles spread and stick to anything in their path. A shed or a garage can be ideal for this. We would never recommend to do it at home. Think in advance of the place to stand your freshly painted object, it may have to stay there overnight. 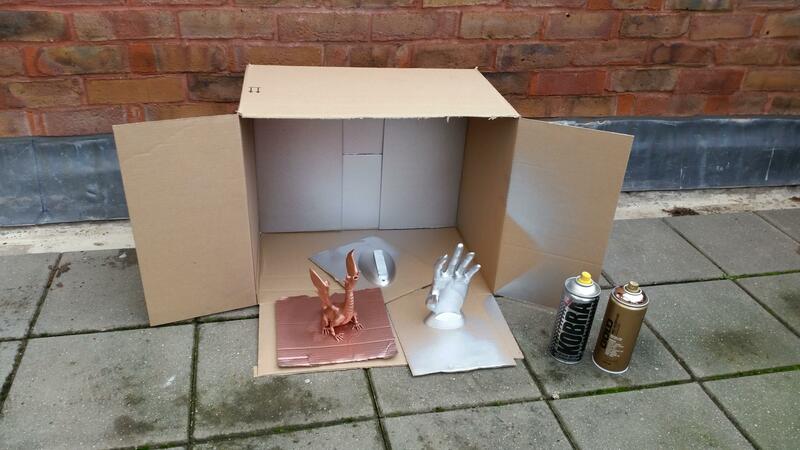 We found that spraying while holding a print inside a cardboard box worked well. It protected the surroundings from paint and sheltered the finished item from dust while drying. Type of paint: There are different types of spray paints: the ones transparent with just the glitter and the ones that actually apply the colour. When using the first option, the original colour of the make will come through. We also found, maybe unlucky with the brand, that it needed a lot of spraying and took too long to dry. The silver metallic spray paint though, was incredible. It dried much quicker and was easy to apply. Safety: Spray paint is a hazardous product. It is flammable, toxic and can cause harm when breathed in. In some shops there is even an 18 age limit for some spray paints. Please make sure to wear appropriate clothes, rubber gloves and respirator. Hi, great work! 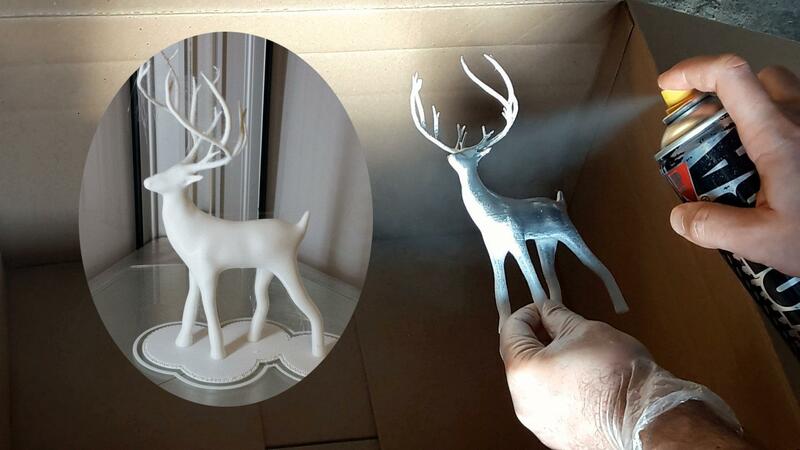 I’m trying to use metallic spray to paint my pla works… but i still have not good results, because my spray paint cannot be covered by a top transparent coat (the metallic layer becomes dull and darker)… And if i don’t use top transparent coat, my metallic layer, even after 2 days drying, gets dull or has fingertips if i touch it a bit hard… So i’d like to know if Rust Oleum Metallic paints have good results without top coat… if they avoid fingertips or signs over the metallic layer… or even if they can be covered by a protective transparent top coat. Many thanks and regards! 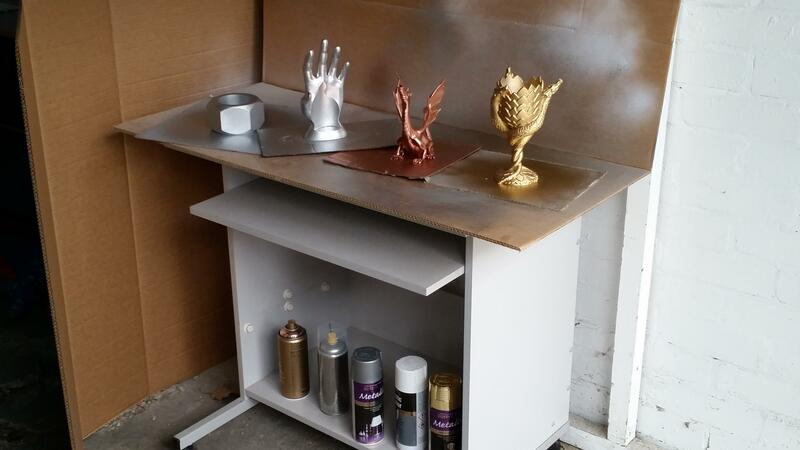 We tried Rust Oleum Silver Spray Paint and it wasn’t as shiny as Kobra Silver. Kobra’s downpoint though is its drying time which is way too long. Layers have to be very thin so it takes much longer than Rust Oleum Gold/Silver. We use a cardbox to move the models around without toughing them until they have dried well. Also, we’ve never tried applying a transparent coat, yet. Have to dig into how it works. Depending on a type of paint there is a different drying time between coats. Some can be reapplied after a few minutes, but some require a much longer waiting time. Please check the manufacturer’s guidelines for touch dry and completely dry.